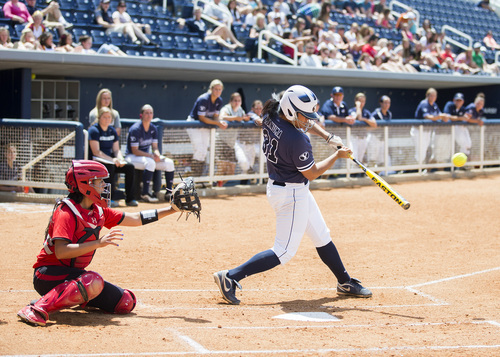 Courtesy | BYU Junior infielder Katie Manuma (31) led the Cougars with six home runs and 44 runs driven in. BYU plays Oregon on Thursday. Provo • The West Coast Conference has added softball to its lineup of sports this year with the addition of Pacific giving the WCC six softball-playing schools. That means the BYU softball team will play in its fourth conference in the last four seasons when WCC play begins in early April. The Cougars have won five straight conference championships. But 12-year coach Gordon Eakin has more pressing issues on his mind right now than making it six straight, after the injury-depleted Cougars went 2-3 at a season-opening tournament last weekend in St. George. "Our expectations are to win, and to win at a high level," Eakin said. "We have a very talented team, but it is also young and inexperienced." The Cougars lost all three games by one run apiece, giving up leads in all three losses. "We could have easily been 5-0," Eakin said. Still, the team was picked by the league&apos;s coaches to win the WCC; senior Katie Manuma and sophomores Marissa "Gordy" Bravo and Coryn "Coco" Taualii are on the preseason all-conference team. Manuma will move from first base to third base this season and also do some relief pitching. Bravo, who earned Easton All-America first team honors last year after leading the Pacific Coast Softball Conference with a .389 batting average and 43 RBIs, tweaked a hamstring in St. George and missed the last three games. She is questionable for this week&apos;s five-game tournament in Las Vegas and Henderson, Nev. Freshman Karli Lehr will miss her Las Vegas homecoming because she tore an ACL and is out for the season. Another freshman expected to contribute, former Murray High star Lauren Bell, was hit in the face by a thrown ball and is trying to play shortstop while wearing a mask to protect three fractured cheek bones. "She&apos;s not the player she is capable of being yet," Eakin said. Another freshman, infielder Alexa Strid, was ruled academically ineligible to compete because she was home-schooled and apparently didn&apos;t meet some NCAA requirements. The string of bad luck left Eakin with just 15 available players in Saint George, and two were on the bench nursing injuries. "Avoiding future injuries is going to be a big key for us," he said. Last weekend&apos;s tournament marked the first time the Cougars played on dirt and grass in nearly four months, but Eakin said that can&apos;t be used as an excuse because most of their opponents were from cold-weather climes as well. "We just need our young pitchers to blossom," he said. Senior Tori Almond, the former state MVP from Bingham High, anchors the staff after going 12-8 with a 2.88 ERA last year. She&apos;s fourth in BYU history in wins, strikeouts and shutouts. Weber High&apos;s McKenna Bull, a three-time all-stater, and Ashley Thompson, a record-setting recruit from Washington&apos;s Connell High, round out the staff. Thompson broke the state strikeout record, pitched seven-straight no-hitters and earned Washington Gatorade Player of the Year honors lsat season. Outfielders Carly Duckworth, a senior, and Lacey Millett-Hofstedt, a junior, will also be valuable contributors this season, Eakin said, along with infielders Jenna Goar, Ashlee Robinson, McKenzie St. Clair and Megan Arnold. Catcher Sydney Broderick drove in four runs against Nevada and East Carolina, while Arnold homered against Texas-Arlington last Saturday. St. Clair reached base three times against UTA and leads the team with a .667 batting average and seven RBIs through five games. She earned inaugural WCC Softball Player of the Week honors on Monday.